To what extent should criminal law be used to protect the consumer? 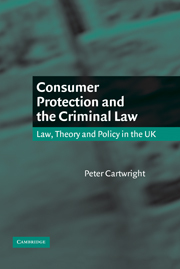 Peter Cartwright evaluates the role of criminal law sanctions in consumer protection from an economic and social perspective. In this important new study the author examines the rationales for protecting consumers, and considers the role that legal techniques play in fulfilling these. In addition, he analyzes criminal law doctrines such as strict, corporate, and vicarious liability, and suggests that they require re-evaluation. This study will be of interest to academics, undergraduate and post-graduate students as well as lawyers. Preface; Acknowledgements; List of abbreviations; 1. Consumer protection rationales; 2. Techniques of regulation; 3. The role of criminal sanctions in consumer protection; 4. The use of the criminal law; 5. Consumers and safety: the protection of physical integrity; 6. The protection of economic interests; 7. The enforcement of regulatory consumer law; 8. Conclusions; Index.